Here are 12 stats you may not know from the Packers 38-28 win over the Kansas City Chiefs (the stats all reflect regular season games unless otherwise noted). The victory on Monday Night Football brought the Packers record to a very mediocre 33-31-1 on Monday night games since 1960. (Note: The Packers were 3-0 on Monday night before Monday Night Football started in 1970). The Pack is only 6-11 on MNF since 2005, although they are now 9-4 at home on MNF since 2000. This was the 23rd straight year that the Packers played at least one game on MNF in a season. When the Broncos play on MNF on December 28, it will be their 24th straight year on MNF, longest active streak in the league. Green Bay is now 9-1 at home in non-Sunday games since 2006. Randall Cobb carried the ball once on a running play for 12 yards. In his career Cobb has gained 264 yards on 28 rushes, 9.43/yards per carry. Of all NFL players who have carried the ball 25 or more times in their careers, Cobb ranks fifth all-time in the league in that stat. Louis Lipps gained 388 yards on 29 carries for 13.38/yards per carry, tops in the history of the NFL. Rookie Ty Montgomery had a TD reception in last night’s contest. The Packers have now had a rookie score a TD each season for the last 12 years. Green Bay held the Chiefs scoreless in the first quarter. They are now 87-24 (.784) in games where they hold the opponents scoreless in the first quarter. They have now won 10 straight when they shutout the opponents in the first period, and have won 35 straight at home dating back to 2007 when the defense pitches a shutout in the first quarter. The Pack has now won 16 straight when they score 14 or more points in the first quarter. They are 28-4 (.875) in such games since 2000. The Packers scored 24 points in the first half last night and have now won 24 straight when they get 24 or more points in the first half. Since 1970, the Packers are 48-2 (.960) when they tally 24+ points in the first half. James Jones scored a TD in his third straight game. This is the fourth time in his career that he has scored a TD in three consecutive games in a season. The last time he accomplished this was in the last three regular season games of the 2012 season. Aaron Rodgers had five TD passes in the game with no interceptions. 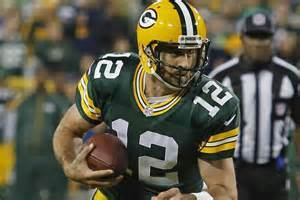 The Packers are 27-4 in games when Rodgers has at least three TD passes and no interceptions in a game. Cobb became the 12th Green Bay receiver since 1960 to have three TD receptions in a game. Sterling Sharpe tops the club with four games with three or more TD receptions. Antonio Freeman, James Lofton and Jordy Nelson each have two such games in their careers with the Pack. Last night was the 43rd time since 2000 that the Packers scored 35 or more points in a game. That ties the Packers with the Broncos for third in this category in the league. Indianapolis is second with 46 games and the Patriots are first with 61 games with 35+ points since 2000. The Packers are 42-1 in those games where they score 35+ points. NFL teams have won just over 93% of the games when a team scores 35 or more points. The Packers “D” had seven sacks in the game. It was the 14th time since 2000 that the team had six or more sacks in a game. The team is now 13-0-1 in those games. Kansas City’s Jamaal Charles rushed for three TDs. It was the 12th time since 1970 that an opposing player had three rushing TDs against the Pack, but it was only the third time the Packers have won a game when that happened. Bonus stat: The Packers defense allowed only 75 yards rushing on 18 carries in the win over the Chiefs. It was the 31st game since 2010 that they held the opposition under 100 yards rushing. They are 26-5 (.839) in such games; those 31 games ranks 24th in the league. Their .839 winning percentage when they hold opponents under 100 yards rushing, however, ranks fourth in the league. NFL teams have a .684 winning percentage since 2010 in games where they hold the opponents to under 100 yards rushing.